A glue, sealer and finish all in one! Dries to a glossy finish. 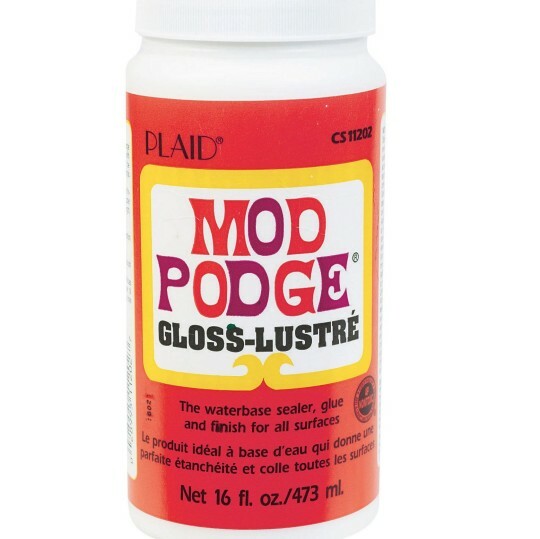 Mod Podge is Wonderful!!! A little pricey from ss but still a great product! I just LOVE Mod Podge... it is so easy to use since it is a glue and sealer all in one! Here's an easy and cheap project: Cut pictures from a magazine and decoupage them onto the center of a paper mache box. You can paint the box first and then after a coat or two of mod podge on the picture once it's dried trim it with lace or beads or ribbons. Will look like you spent a fortune and nobody has to know it was CHEAP!!! Great for Girl scouts scho0l projects valentines boxes soooo much more!